This quicktime movie is made from the original film scans of the Terminator robot which we shot to make a hologram for the Terminator Boxed Set in 1992. We shot one of the life sized robot models from the movie on 35 mm film using a modified Mitchell 35mm camera, and had the film scanned to tape at GW Hannaway and Associates in Boulder, Colorado. Anyways, these are the film originals, cropped and scaled for the web. If the movie doesn’t display above, you can see the source movie here. Quicktime VR of the Very Large Array in New Mexico, from 1996. View flat image here, or, if the embedded movie above doesn’t display for you, you can see the movie directly here. Quicktime VR of a traditional taro garden on Maui, Hawaii. Shot in 1996, I put together this whopping 2 meg “hi res” QTVR in 1997 thinking nobody would ever wait for the whole thing to download. 10 years later and 2 megs isn’t even a consideration. Enjoy. If the embedded movie doesn’t work, you can see the movie here. 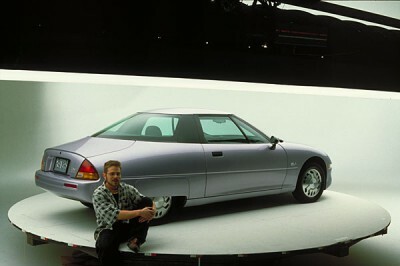 In 1996, I was hired to photograph in QuickTime VR the General Motors EV1 Electric Vehicle for gmev.com, and it remained online until a few months ago (2006), when a less than positive film about the EV1 was released. I haven’t seen the film, so I can’t comment. I also had the good fortune to drive the vehicle. The pickup was amazing, and it was utterly silent. Awesome ride. Below are links to the QuickTime VR movies of the EV1 which I created. I have the source files, film, and video from the shoot, so someday I may create a higher resolution version of this project.